This charming ring is a rose-colored delight featuring a beautiful marquise-cut gemstone surrounded by numerous diamonds that bring light and joy into the piece. The Marquise-Cut Pink Topaz and Diamond Halo Ring in 14K White Gold is the perfect ring for someone who wants a lot of sparkle and a lot of color. The marquise-cut pink topaz measures 5mm x 10mm and is really the heart of the ring, filtering the light through its many facets and displaying a gorgeous flush of pink and purple. 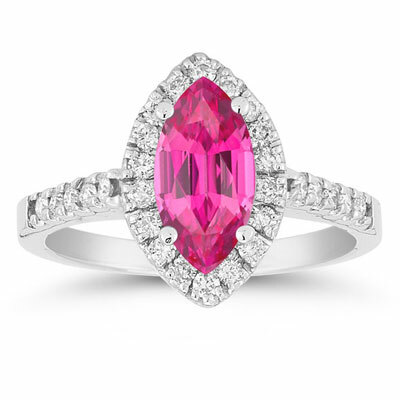 To further emphasize the center stone, the pink topaz is surrounded by a halo of sparkling diamonds that catch the light, and the ring also features another setting of diamonds that extends across the top of the 14k white gold band (2mm). In total, there are 28 diamonds set into the ring with a total carat weight of 0.28. This ring has an interesting shape with its marquise cut and an even more impressive color found in the exuberant pink topaz. It makes for a lively burst of color to add to one's collection. We guarantee our Marquise Cut Pink Topaz and Diamond Halo Ring in 14K White Gold to be high quality, authentic jewelry, as described above.